1. Festoon 5050SMD automotive LED bulb with 12V DC voltage, various colors are available. 3. Long service lifespan: 50,000 hours. 4. Solid-state, high-shock, and vibration-resistant. 5. Designed to work in negative ground vehicles. 7. Customized designs are welcome. 8. Applications: parking, stop, and turn signal. 1. Easy DIY installation universal design. 2. 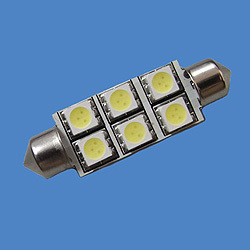 LED type: 5050SMD LED. 3. LED quantity: 6 pieces. 4. Voltage: 12V DC. 5. Colors: red, green, blue, yellow, and white.